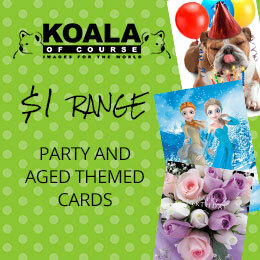 Our $1 Koala range of Cards and Gift Wrap is easily integrated into retail locations due to the unique and visually outstanding display systems. Our $12 Koala range of Cards and Gift Wrap is easily integrated into retail locations due to the unique and visually outstanding display systems. If you are interested in becoming a Licenced Koala Distributor, click below for details on our distributor program and instructions on how to apply. We are proud of our quality. If you are a retailer, are interested in our products and would like to see some samples of our collections, fill out our request form and we will send some to you right away. Need to speak to a representative? We are happy to help. Click below to request a rep call back. Our Harmony range is designed to provide a rainbow of choice. Whatever the reason, whatever the season, reach out and send a rainbow of colour to someone you love. The Harmony Collection range is the latest edition and is strongly focused on soft pastel colours, printed on speciality textured and stocks with computer generated imagery. Memory provoking to a fun and subtle childhood, reminiscence of lighter and simpler times. The range is designed through the successful blending of current image trends, mixed with patterns and designs to reflect the softer side of the 70’s. The range incorporates unique and various finishing’s including, cold foiling, spot UV gloss varnish, raised and 3D elements and glitter. 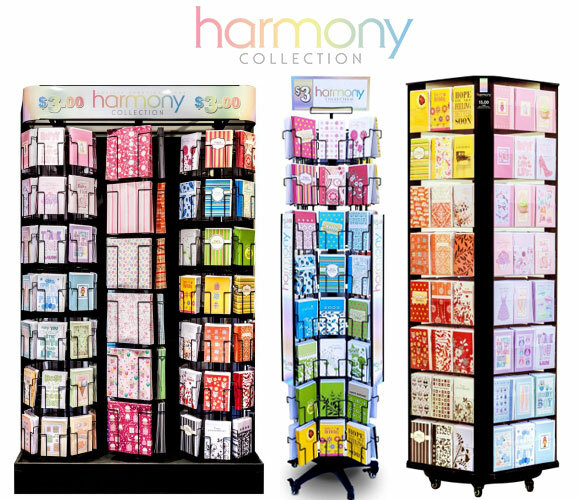 The Harmony range includes handmade, sweet harmony and watercolour themes. 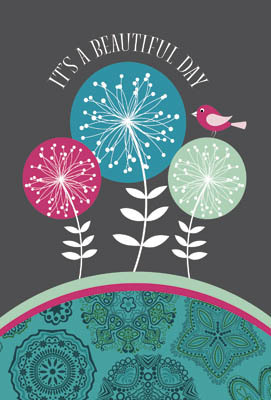 Harmony cards have verses on front and or internally to simplify the giving experience. 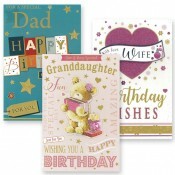 Our Harmony handmade cards will bring back your childhood memories with the soft colours, silver and gold embossing, satin ribbons, bows and raised elements. Emotive verses are printed internally to lovingly express your sentiments. The handmade range offers two complete spinner display sides of choice. 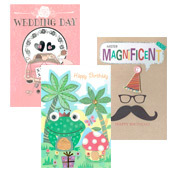 There is a card for every occasion, big and small. Finish: Metallic spot print, raised and 3D elements Envelope: Various coloured lick-n-stick envelope. As the name suggests this is a luxury range, quality and style at an affordable price. Titles feature 3D elements, glitter, foil and embossing. 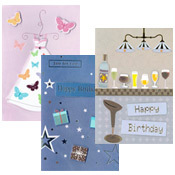 An everyday greeting card collection with occasions from Birth to Death. Let your loved ones know how much you care with this value for money range. 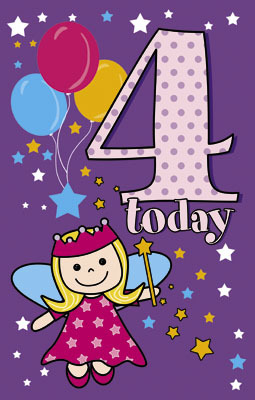 Titles: 41 Greeting Cards Size: 115mm x 170 mm Print: Full colour print with various treatments - 3D elements, glitter, gold foil and embossing. All titles beautifully versed inside. Stock: 300gsm card stock. Handmade titles only packed in a cello protective sleeve. Envelope: 100gsm White envelope. Chase your dreams, they are waiting for you to catch them. 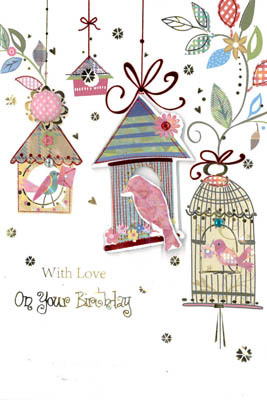 The Sweet Harmony range of cards will amaze you with their quality, unique finishes and verses. 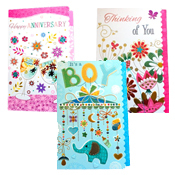 Scalloped edging, metallic colours with imagery printed on all sides, these cards cannot disappoint. Print: Full colour- Outside and inside some with unique verse message. 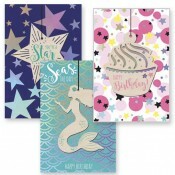 Stock: 300Gsm matt art card Finish: Embossed imagery with metallic cold foiling and scalloped edging. Envelope: White lick-n-stick envelope. Our watercolour range will bring back memories of tie dyeing crisp white fabrics in vibrant colours of the rainbow to create sensational designs. Happy, lighter times with messages to awaken the soul. 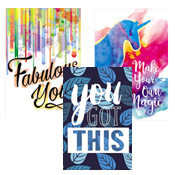 Titles: 24 Theme: Brilliant colour with motivational wording Size: 115mm h x 170mm wide Print: Full colour- Outside and inside Stock: 300Gsm Hessian art card Finish: Spot gloss varnish Envelope: White peel-n-seal envelope. 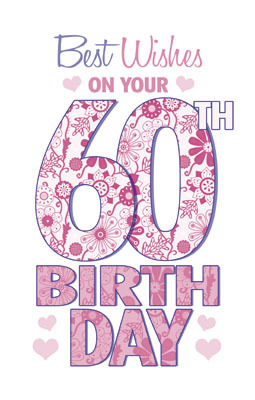 When a card just sometimes isn’t enough – say it with a card and keepsake all in one. From Baby and Birthday to Love and Congratulations, Woodstock is a unique way to send a special message. Each card features a beautifully laser cut wooden decoration which can be easily removed to keep and display. 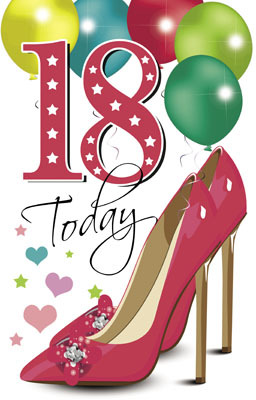 Titles: 12 Greeting cards Print: Full colour print with holographic foil highlights and a wooden hanger with colour foil. Stock: 300gsm card stock in a cello protective sleeve Envelope: White lick & stick envelope.